October 2, 2015 – DKI, North America’s largest disaster restoration organization, announced today that its CA location will be participating in a Habitat for Humanity build in Martinez, CA on Friday, Oct. 2, 2015. 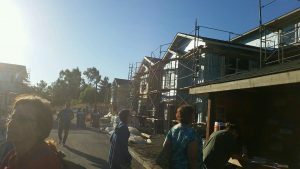 For the second consecutive year, the CA office employees will meet with other volunteers to assist in building a brand new community, called Muir Ridge, which will consist of approximately 20 four to three bedroom homes. The homes are scheduled to be completed in Spring/Summer of 2017. Last year, D KI and the other voluteers assisted with laying and pouring the foundations of each home. This year, the jobs consist of carpentry and electrical services, roofing, caulking, painting and siding of the homes, as well as fitting the doorways of each room. DKI offers additional PTO to encourage corporate employees to give back to their local communities nationwide.